Détendez-vous dans cette maison de montagne magnifiquement rénovée et revêtue de cèdre! Parfait pour une retraite en famille ou une réunion entre amis. Détendez-vous près du foyer au bois après une longue journée sur les pistes (ou dans les points de vente de Tannersville)! Vous vous sentirez comme à la maison dans la cuisine bien équipée et bien équipée avec des plans de travail en granit et beaucoup d’espaces de comptoir ou dégustez des plats locaux dans l’un des nombreux restaurants à proximité. Profitez du charme de la maison depuis le hall surprenant et les poutres en bois apparentes jusqu’aux puits de lumière, planchers de bois franc, grandes fenêtres et portes coulissantes qui vous permettent de profiter du magnifique paysage naturel. Le pont avant offre suffisamment de place pour la détente en plein air. Accès Internet sans fil et plusieurs téléviseurs dans toute la maison. Really enjoyed my stay here, the owners were very sweet and very clear about everything and willing to help if you needed any questions about anything. I highly recommend them. We stayed here with 5 people and it definitely had enough room for all of us. The beds were super comfortable and there was plenty of lounging space. We also had ample kitchen space to cook for all of us as well. The tvs are old and the pictures on them were not great. We also had a few other issues during our stay but Zach and Sarah were very attentive and available to resolve as best they could. We definitely would rent from them again. PS location was amazing for Big Boulder/Jack Frost skiing! This house had plenty of room for 6 adults and two kids with room to spare. Having two family rooms gave the kids and adults a place to hang out separately. The owners were always quick to respond with every question leading up to the day of our reservation. House had plenty of room. Large kitchen extra sitting areas. Good location. Beds were comfortable. Only drawback was outdated TV’s . Picture was horrible. Other than that all was good. We had a great time in this cozy and charming mountain house. House has everything you need for the weekend. Only complaint is the WiFi was having some issues, but owner was very quick and responsive in attempting to resolve the issue. Thanks for having us! As others have noted, the house is roomy, every room being more than ample size for its purpose. It's not a condo on the 18th floor in Lower Manhattan; it's a big cabin in the woods in the mountains of PA where you can sit on the decks and watch the deer walk in the yard at dusk, and enjoy the fresh mountain air with your morning coffee. Great areas for walking and several nice restaurants within less than two miles. 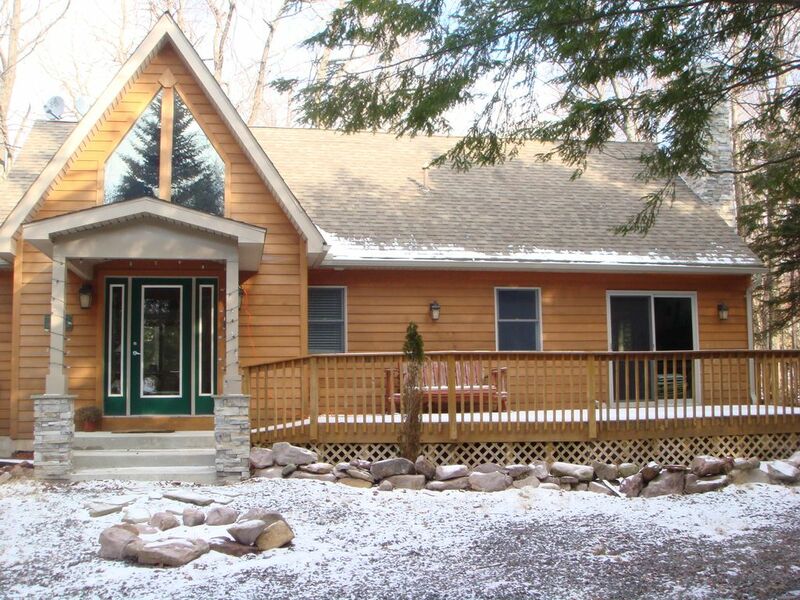 15 minute walk to all the amenities of Split Rock Lodge and Galleria. Washer and dryer a big plus. Communicating with Zach was a breeze.